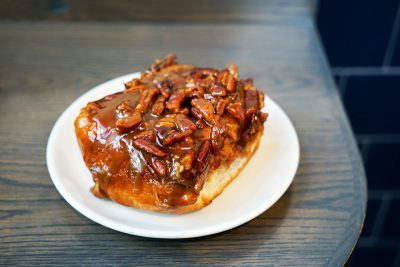 Flour Bakery and Cafe is home to Boston’s famous sticky buns, which were featured on Food Network’s “Throwdown with Bobby Flay.” We can definitely attest to its hype and deliciousness. After devouring the bun in minutes, the ooey-gooey goodness completely made up for a below-par contender we had tried at Tatte Bakery and Cafe. The brioche dough of the bun creates a fluffy texture that is so soft it can be pulled apart with your hands. Filled with cinnamon sugar and smothered in a brown sugar-honey goo, the flavors of caramel and honey lingered on our taste buds after each delicious bite. The glazed pecans scattered on top give the bun a crunchy finish and an elegant look for the perfect Instagram snapshot. The bun is also topped with a generous amount of caramel, so we knew we were in for a mouthwatering treat! Each bun sells for $4, but the generous size is sufficient to share with a friend. It’s a popular item on Flour’s menu and sells out fast. (We called ahead to the bakery to reserve the last bun). 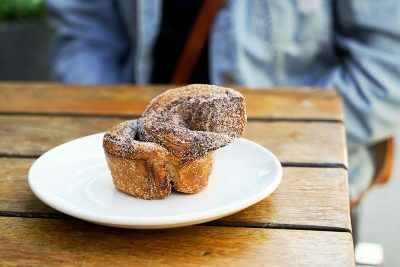 Flour’s Back Bay location is not very spacious, and we struggled to find quick seating, so this is the perfect pastry to snag on the go. While the buns are freshly baked every day, the only thing we wished was for the sticky bun to be served warm. Ultimately, we came in with high expectations for this sticky bun, and we left with a craving for more. Located in the South End near the Prudential Center, Cafe Madeleine is a quiet corner bakery and cafe perfect for anyone who enjoys French pastries. With indoor seating lining windowsill tables, the bakery is a great spot to enjoy a cup of coffee and a pastry while watching the cars and people pass by on Columbus Avenue. When we arrived, the warm and welcoming atmosphere intrigued us, as did the wonderful sweet smells coming from the kitchen. 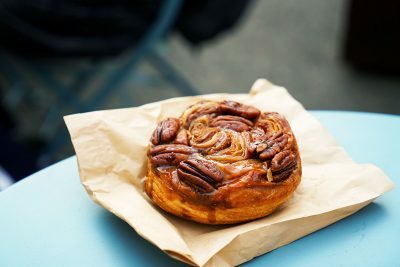 We quickly ordered the cinnamon roll, and for $3.50, we began enjoying the buttery goodness of cinnamon and pecans rolled into a perfectly flaky croissant dough. After finishing each bite, we immediately wanted more of the flaky dough that seemed to dissolve on the tongue. The key success of the cinnamon roll was its hard and flakey exterior contrasted with the soft and chewy interior. The pastry was best enjoyed with a fork to pull apart the crunchy outside. Overall, we felt the cinnamon roll was delicious, but not as tasty as the sticky bun from Flour, and much better than the flaky unsatisfying mess of a morning bun at Tatte. Nestled in Brookline near Packard’s Corner, Clear Flour Bread’s small, rustic interior simply beckons in patrons from the weather outside. Inside the shop are shelves lined with French and Italian-style breads and pastries, waiting to be eaten. The morning bun, despite its unassuming exterior, is clearly a Clear Flour favorite. The bun was so popular, in fact, that it took our writers three separate attempts to beat the crowd and secure the treat before it sold out. Clear Flour’s sticky buns are made out of buttery, flakey croissant dough, which gives them a slightly crisp exterior, but a soft, melt-in-your mouth center. The dough is layered with cinnamon, sugar and walnuts (if desired). The bun was overall quite a treat and no doubt an excellent start to anyone’s morning. However, while we found the bun’s texture to be nothing short of perfection, the cinnamon sugar sticky bun flavor one would expect was a tad too subtle to secure Clear Flour a winning spot in the sticky bun challenge. We found the Clear Flour morning bun to be slightly more akin to a cinnamon-flavored croissant than the gooey, caramel-covered sticky bun we ate at Flour. But for anyone looking for the perfect croissant or simply a subtly flavored sticky bun, this is the place for you! The morning bun was also around $3.50, falling right into step with the other locations’ price ranges. Tatte, a cafe and bakery chain with 11 locations across Boston, Cambridge and Brookline, serves as a great place for both a morning coffee or a gourmet lunch. As evidenced by the extensive menu in view from the Fenway location’s front door, it seems as though the cafe is visited more for its sandwiches and breakfast dishes than its pastries. It took us three tries to find a Tatte location with morning buns available, which built up a lot of anticipation. However, upon trying the actual bun, we found it was quite a disappointment. The bun itself looked nice, as it was covered in sugar, but it was far from how a normal sticky bun should appear. It was more of a dry cracker-type pastry that resembled the taste of a French palmier. The inside of the pastry was almost hollow, so there was not much bun to eat. Upon finishing the pastry, we were left clueless as to why it was sold out in multiple locations. 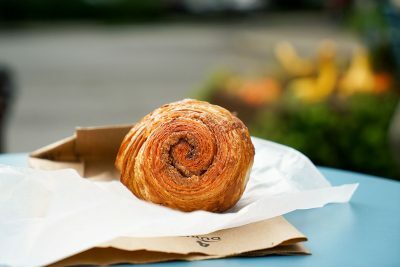 The morning bun from Tatte would be something to eat if you were having a cup of coffee and realized that you wanted a small bite to eat. Then again, there are lots of other delicious pastries on offer at Tatte — everything from chocolate hazelnut brioches to halva sesame tea cakes to pistachio cherry tarts. It is not worth going out of your way to find these specific morning buns. Well written article guys. Avery you must remind me of those delicious sounding sticky buns on my next visit. Good job!